There are two issues that can result when a driveway has sunken down: it is a trip and fall hazard and vehicles can be damaged. The idea is for an experienced St. Paul & Minneapolis asphalt paving company to work with sunken driveway slabs before they crack. If they crack, it is best to fix the ground where the slabs go and then replace them. Nonetheless, being able to fix sunken slabs before they crack rather than replace them is a way to affordably extend the life of the existing driveway for years to come. This is something that will save a great deal of money over time and ensure that the driveway continues to look great for as long as possible. When dealing with sunken driveways, it is best to deal with the reason for the sinking. There are different factors, such as freezing and thawing, animal burrowing, soil erosion, and the washing away of the ground underneath due to water infiltration that contributes to sunken driveways. By gently lifting up the concrete slab, the voids can be filled underneath. A clean surface can then be created and any cracks and holes can be addressed. This will create a long-term solution for most of the problems that contribute to sunken driveways. Most sunken driveway leveling projects are completed in a single day. It does depend on how extensive the sinking is and what sorts of repairs and replacements may need to be made. When concrete needs to be leveled, there is no having to wait for it to be used. In almost all cases, the surface can immediately be used. With our concrete leveling process, we don’t have to dispose and remove old concrete unless it is absolutely necessary. There is also no need to acquire building permits and the job time is reduced, which translates into lower costs. Once the job is done, you will not be able to tell that anything was ever wrong with the driveway. The end result after our concrete paving company is done is a surface that you can safely walk on and drive on. It becomes a safer surface for kids to play and the aesthetic appeal of the driveway increases exponentially. If your driveway is sinking, it is time for you to do something about it. With 30 years of experience we make some of the best concrete repairs Minneapolis has to offer. A sinking driveway can cause damage to car tires, and even to vehicles, not to mention that they are dangerous. If your driveway or apron is sinking, it is time to fix it so that it is a safer surface. 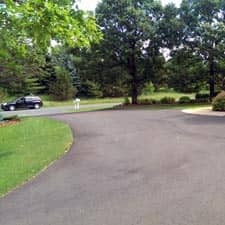 To learn more about our sunken driveway repair services or any of our other concrete repair services call ACT Asphalt Specialties at (651) 484-1696 to request a free estimate.